Tamaño de esta previsualización: 502 × 599 píxeles. Otras resoluciones: 201 × 240 píxeles · 402 × 480 píxeles · 502 × 600 píxeles · 643 × 768 píxeles · 858 × 1024 píxeles · 1284 × 1533 píxeles. Descripción 18th-century portrait painting of men, with Anonymous, Unspecified, Not mentioned, Unidentified, or Desconocido artist. English: "An anonymous portrait in oils in the Museo Internazionale e Biblioteca della Musica di Bologna is generally believed to be of Vivaldi and may be linked to the Morellon La Cave engraving, which appears to be a modified mirror reflection of it. It is striking how the engraving and the painting 'secularize' Vivaldi: they contain no hint of his identity as a priest. (The fashionable, though slightly informal, dress and self-confident attitude of the composer resemble very closely those of Telemann in the well-known engraving by Georg Lichtensteger.) Ghezzi's sketch likewise shows Vivaldi in a non-clerical black stock as opposed to the white clerical stock and still wearing a wig. (Two years later, in the anno santo of 1725, Innocent XIII was to ban the wearing of wigs by priests.) There is disagreement over whether the hint of red showing in front of the centre of the composer's wig in the painting is a sly reference to his famous hair-colour or simply an unpainted part of the canvas. 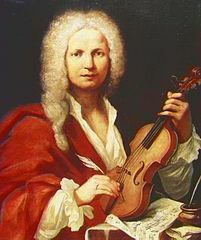 Whatever the case, it is not out of place to observe that, contrary to the belief of many modern illustrators, Vivaldi's wigs were never coloured red." Michael Talbot, The Vivaldi Compendium (2011), p. 148. The proposition that the painting actually depicts Antonio Vivaldi has been questioned by some sources (e.g. by Groves dictionary).